Although it is now a fairly common practice, the use of our coinage to commemorate a special event was relatively rare prior to the 1960s. The principal coin used for commemorative purposes has been the dollar. One of the most attractive of these coins is the one issued nearly thirty years ago to mark the entry of Newfoundland into Confederation. The design of the coin features a view of "The Matthew," the ship on which John Cabot sailed on his voyage to Newfoundland in 1497. Below the waves is inscribed the Latin phrase FLOREAT TERRA NOVA (May the new found land flourish). This piece was designed and engraved by Thomas Shingles, Chief Engraver of the Royal Canadian Mint. The creation by Shingles of this beautiful design becomes even more remarkable when it is realized that it was engraved directly in steel entirely by hand. The more usual method is to make a large model which is then reduced to coin size by the use of a pantograph-like engraving machine. 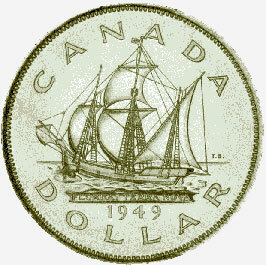 The piece illustrated is part of the National Currency Collection Bank of Canada.